Based on my experience and training, I have the ability to accommodate clients using a variety of techniques. 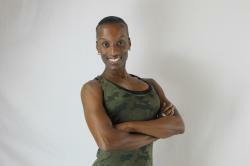 I specialize in metabolic conditioning drills, strength training, flexibility training, olympic lifting and yoga. I will work with you to ensure you are comfortable with your training and able to achieve your goals. As a former Drill Sergeant of the United States Army Reserves and who also served in the United States Marine Corps, I draw on those experiences to work with my clients to achieve their goals through teamwork and encouragement.